I am so, so glad this came up in my pile because I was starting to feel I hadn't really read any fall books and this one hit that mark. It felt fallish for me and I really enjoyed getting cozy under a blanket with this one! This book is being marketed towards people who like Susan Wiggs and Susan Mallery and I have to agree, if you are a fan of either of those authors you will like this book. It's the same writing style and it gives you the same feel as you read it. 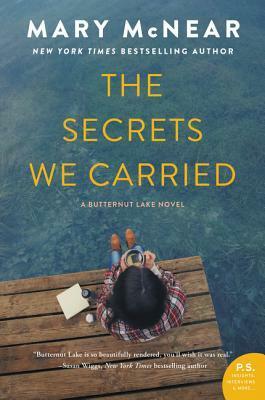 It also should be noted that this book is sixth in the Butternut Lake series but it is a stand alone book. I haven't read the others in the series but I didn't feel like I was missing anything by not reading them, but now I'm interested in picking the others up because I really liked this book. The book follows Quinn and her recovery/grief/reckoning of the deaths of her boyfriend Jake and his friends Griffin and Dom. After the accident and graduation she left town and vowed to not come back. She gets an announcement in the mail of a memorial going up in their honor by someone anonymously so she decides that she needs to put the past behind her. She finds that people that she thought were friends aren't so much anymore and people who should be angry with her aren't and she's surprised at every turn. The entire book is Quinn navigating awkward encounters, stilted conversations avoiding obvious topics, and her trying to work through her guilt of that night because she believes she had a key part in their deaths. She soon discovers that others feel that same guilt and they have all been kind of stuck in that moment. Overall? I really liked this book. I'm actually giving it 5 stars because I couldn't put it down, and it felt like the right book to read right now. I'll admit that Quinn is almost a little annoying and it feels like she takes on too much responsibility that I don't think a reasonable person would. It's hard to remember that the accident happened when they were still kids so I guess maybe that guilt would be expected. The best part of this book is that everyone is kind of webbed together and the ending is fantastic. I finished the book with an audible "wow" and immediately texted my friend that they had to read this book. Sometimes books with so many characters and different pieces gets tedious to keep together but the author really did a great job bringing it together to give us a great ending with no loose ends. Absolutely fantastic. You can pick up The Secrets We Carried on the HarperCollins website! I am so glad you liked this book. I saw the cover the other day and wanted to read it based on that alone, but your review definitely made me want to pick it up. Thanks Sara! This sounds like a book that holds so many real life feelings within the story. I also like that it's part of a series, but can stand alone. Thanks for the review!